For the past 20 or so years, I’ve tried in vain to like coffee. I’ve used every trick in the book and out of the book. It ain’t happenin’. Because I find coffee unpalatable, The Stud muffin is convinced that we can never ‘go out for coffee’ unless we’re both drinking coffee. It wouldn’t matter that I would be there with him, sipping a hot tea, or a hot chocolate. Nope. It’s not coffee, so therefore we can’t go out for coffee unless we’re both drinking coffee and if we both not drinking coffee and we happen to be out, we are officially not ‘out drinking coffee’, we’re just ‘out’. Yeah. TSM is outta his ever-lovin’ mind! Because I can’t seem to wrap my taste buds around a cup of coffee, I started dabbling in hot chocolate. Preferably high end sipping cocoas made from quality imported chocolates. Okay, *that* didn’t make me sound like a snob at all. Oy! I talk about my love of hot chocolate over on my Hot Chocolate Truffle Balls post, so I won’t get into it here. My point is, I can’t do coffee, so I like to experiment with other ways to enjoy hot beverages, namely cocoa. I realize that I may possibly upset a few of you because I’m using organic cane sugar in this recipe and you feel sugar isn’t Real. It is processed, but not to the degree that white sugar is processed and it’s not GMO because it isn’t coming from sugar beets. Turbinado and Raw sugars are also partially processed like organic cane sugar is. Better options would obviously be coconut sugar or sucanat, but organic cane sugar is more readily available to more people than are the other mentioned sweeteners and I’m trying to create recipes that everyone can make, not just some of you can make. While we’re talking sugar, Demerara and Muscovado are two fairly unrefined sugars that would work well in this mixture IF they weren’t such large crystals that may take too long to fully dissolve. But here is the thing. 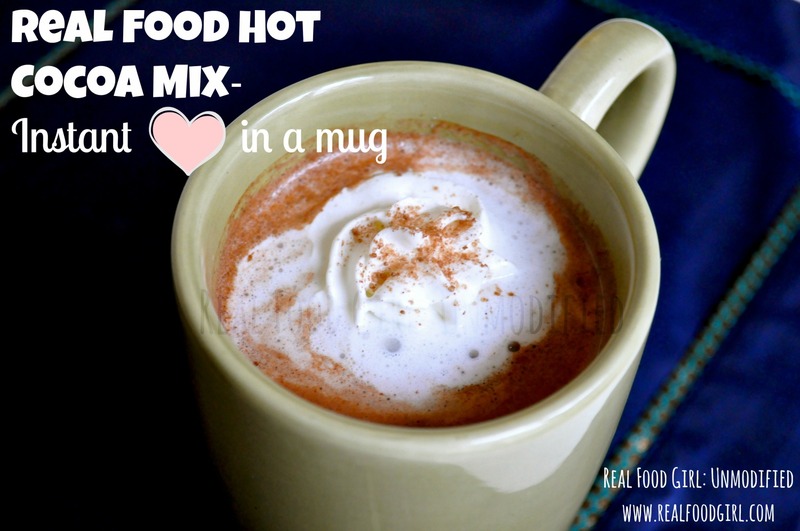 Most of my recipes, and this Real Food Hot Chocolate Mix falls into this category, are great base recipes for you to use as a jumping off point if you’d like to experiment with other ingredients, such as a different sweetener. Go for it! Have fun. Experiment. 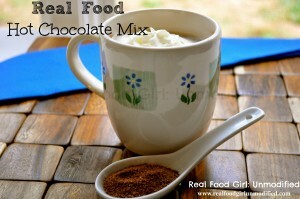 I used some organic dry milk to this Real Food Hot Chocolate Mix. I honestly just heard like a dozen of you gasp aloud. I’m not sure why this ingredient seems to ruffle people’s feathers. Many bakers use this in sweet bread and regular sandwich bread recipes. I chose to use this for two reasons. The first is it imparts a rich taste and a creamier texture to the cocoa. The second is that not everyone can afford organic, grass-fed cream, which I would normally choose to add to my saucepan of milk warming on the stove. Hopefully no one will get uppity because my definition of Real Food may not match yours. 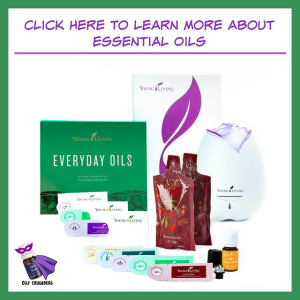 I think we forget to make allowances for those just starting out on their real food journey, or those who may not have access to all the organic foods we have, or may not have the budget we have. I measured the cocoa powder and sugar into a bowl with a lid and gave it a good shake. It just didn’t look like the sugar and cocoa mixed together evenly enough that if I were to put a TB into some warm milk, I wouldn’t have to worry about getting either too much sugar or too much cocoa. That is where the organic dry milk came into play. Adding a third element to the powdered mixture ensured that once I gave that bowl (with the lid on tight) a good shake or 3, I knew that every mug of hot chocolate would turn out the same. This is the brand of gelatin that I add to the mix to beef it up with some healthy protein- but I didn’t add it to the recipe. I put in about 1/4 cup total. 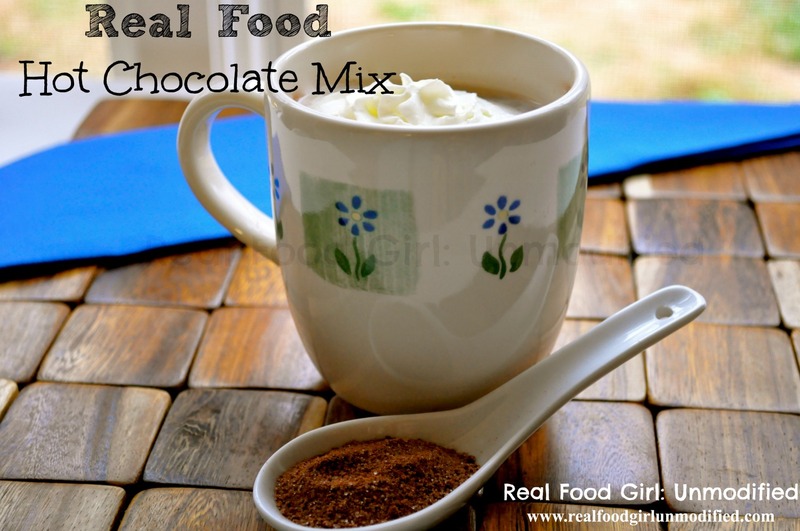 Your go-to powdered cocoa mix that is organic, tasty and doesn't contain any chemicals. 1/2 tsp. cinnamon- optional, but tasty. In a 2 cup bowl with a tight fitting lid, add the cocoa, sugar, dry milk and salt. Affix the lid securely and shake vigorously for 10 seconds to ensure all ingredients are well combined. Store in a cool, dark place until ready to use. Should keep for up to 2 months. In a small saucepan over medium-low heat add 12 ounces (1-1/2 cups) of organic grass-fed whole milk. Whisk until the mix is fully incorporated into the milk. This will take about 30-60 seconds. Continue to warm the cocoa over medium-low heat until nice and warm, about 3-5 minutes. 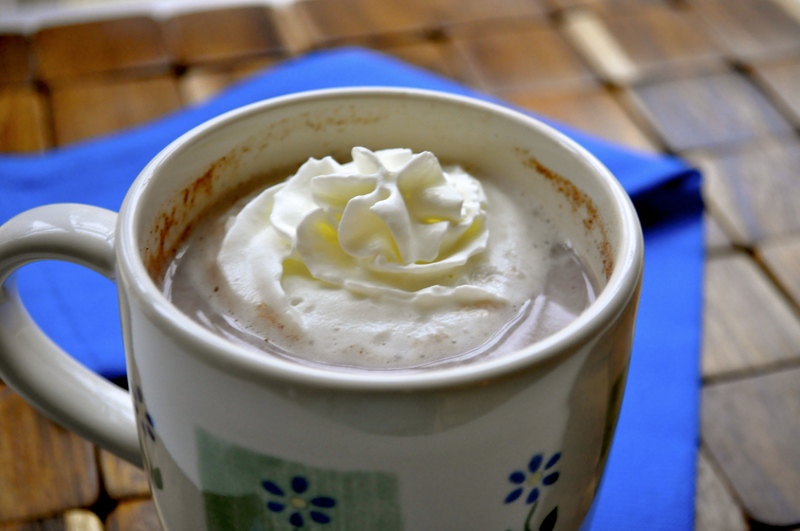 Pour into a mug and top with homemade plain or peppermint whipped cream. You can start the sugar at 2/3 of a cup. Keep in mind that this may yield a more bitter cocoa. I realize 3/4 cup of sugar seems like a lot, but you are only using 1-2 TB of mix per 12 ounce mug of cocoa. That's a cup and a half of milk to 1-2 TB of cocoa mix. This yields 28, 1 TB servings, or 14, 2 TB servings. **UPDATE** I started adding 1 Tablespoon of Collagen Hydrolysate (Great Lakes brand in the green canister) to up the protein content of this and make it even better than the packaged mixes you get from the store. Is it possible to increase (double?) the powdered milk so this could be made with hot water? Wendy- give it a try. Maybe just make a one serving batch 1 TB cocoa, 2 TB sugar, 2-4 TB powdered milk. Then adjust as needed until it tastes good. I need the healthy fat in my diet, so I made this to go in milk, but I see no reason why you can’t try it with water. Let me know how it turns out if you do.